Acomet-chasing spacecraft swinging by Earth this week has snapped magnificent newimages of our home planet. The newphotos come from the European Space Agency's Rosetta spacecraft, which willmake its closest approach by Earth Friday at 2:45 a.m. EST (0745 GMT), duringits third and final flyby past the planet. The Rosettaspacecraft's OSIRIS narrow-angle camera captured three images of Earth with anorange, green and blue filter, and from a distance of about 393,330 miles (633,000km). The resulting illuminated crescent is a combination of the trio. 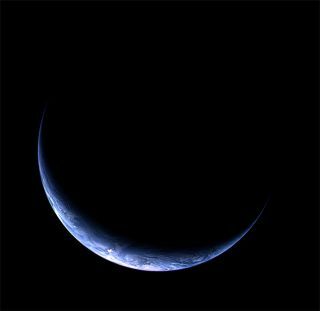 The combinedimage shows the Earth as blue sliver, with the South Pole roughly in thecenter. The outline of Antarctica is visible beneath the clouds that form thesouth-polar vortex, a natural continent-wide tornado of sorts. Pack ice infront of the coastline, due to its strong reflectivity, causes bright spots inthe image. Besidescapturing stellar images, the flyby could help unravel a mystery that hasstumped scientists for two decades. Space scientists have noticed craft varythe amountof orbital energy they exchange with Earth during planetary flybys. Thisvariation shows up as a tiny difference in speed either gained or lost whencompared with that predicted by fundamental physics and that actually measuredafter the event. Duringtomorrow's flyby, scientists will track the craft's orbital energy, as theyhave no idea whether Rosetta will get a slight boost, brake, or experience nospeed-change at all. Rosetta waslaunched in 2004 with a 2014goal of entering low orbit around the comet Churyumov-Gerasimenko, beforeselecting a landing spot so its small lander Philae can travel with the icyobject as it moves toward the center of the solar system. Then, Rosetta shouldhave a front row seat as the comet gets heated by the sun and sheds its outerlayer, finally producing comets' claim to fame ? its tail.